GRAND JUNCTION, CO ― May 2016 ― GPD Global, a manufacturer of precision fluid dispensing systems for high-volume 24/7, low-volume/high-mix, and R&D production offers individual pumps for integration into your existing platform – the Jetting NCM5000 Pump is one of them. 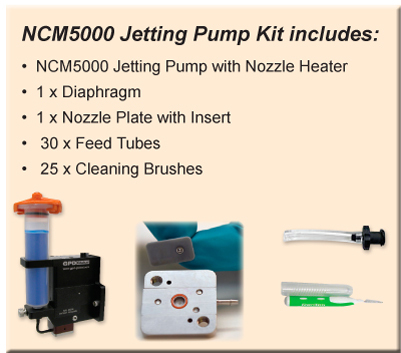 The Jetting NCM5000 Pump simplifies jetting to its basic elements: hammer, pin, and nozzle. Only the pin and nozzle are wetted parts. This means easy set-up, cleaning, and upkeep. The pump can be disassembled for cleaning in a matter of seconds. The drive system, being pneumatic, is designed for reliable, high speed operation, and requires no maintenance or calibration. Upgrade your existing dispense technology (auger pump, needle valve, time pressure, etc.) today with the benefits of the Jetting NCM5000 Pump! A jetting pump does not use a traditional needle which typically needs to be 0.25 mm above the surface. Instead, the nozzle floats at a height 2-3 mm above the surface, eliminating the impact of wavy surfaces. Plus, throughput increases with the high speed operation and elimination of the Z-axis motion commonly associated with traditional needles dispensing. Upgrade or replace your high maintenance pump with our efficient and simplified NCM5000 Jetting Pump. 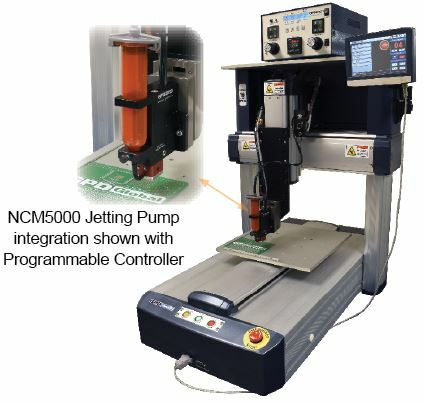 NCM5000 Jetting Pump configurations are available for integration into third party dispensing systems. Configurations include everything you'll need: mounting hardware, controls, and electrical interfaces. Direct Integration. Includes compatible electrical and air connectors, and mounting hardware and is compatible with your existing controls, software, and programming methods. Programmable Controller Integration. For systems where direct integration is not possible a complete programmable controller integration kit is available. 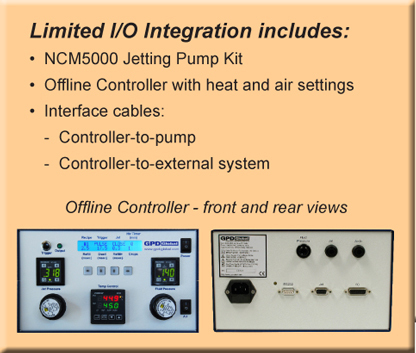 This kit includes an NCM5000 Jetting pump, programmable controller, and mounting hardware and cabling that are configurable to suit your system needs. Supply power, air, and an on/off signal for enhanced dispensing. GPD Global is an equipment manufacturer of high-quality, precision, automated fluid dispensing and component-prep systems. The company is an international, state-of-the-art equipment supplier for the PCB assembly and semiconductor industries. 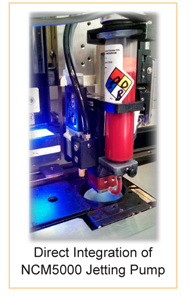 It designs and manufactures a variety of automatic fluid dispense systems. GPD Global also manufactures an SMT Cover Tape Peel Tester and Component Prep equipment for Thru-Hole applications. The company is committed to offering premium service to its customers and has sales and customer support affiliates located throughout the world, including North America, South America, Europe, the Middle East and Asia-Pacific. For more information, visit www.gpd-global.com.